Description: Rare and choice Medieval Papal bulla seal for Pope Urban IV, circa 1261-1264 AD. The seal once protected a Papal letter that was transported from Rome to England. To ensure the integrity of the letter, a cord was wrapped around the document envelope and an official seal (i.e. 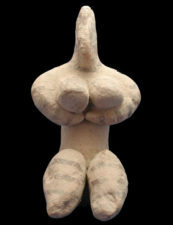 bulla) with the Papal inscription was impressed on a lead slug encasing the central knot. The obverse features the name of the Pope with the legend: V[R] BANVS PP III[I] in three lines. 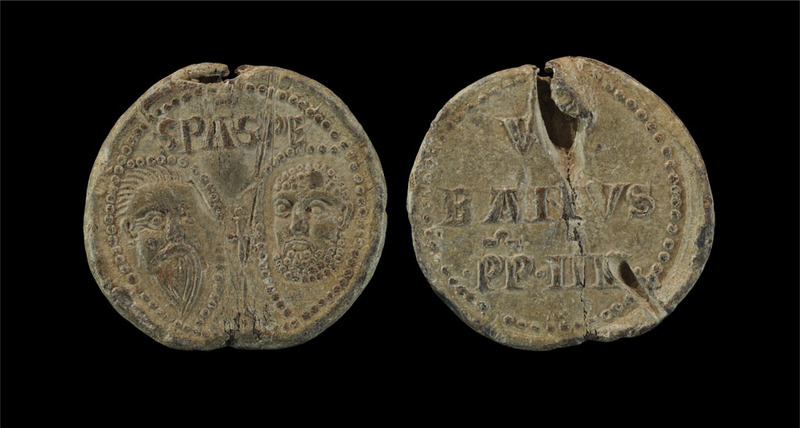 The reverse features a remarkably sharp portrait of Saints Paul and Peter divided by long cross with S’PA (Sanctus Paulus) and S’PE (Sanctus Petrus) above. 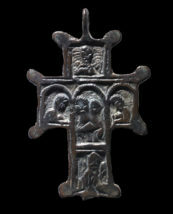 St Peter is seen on the right, looking left, with St. Paul on the left looking right, with a long pointed beard, within a backwards-C shaped beaded border, joined to the main. Condition: The portraits and inscriptions are sharp and extremely well preserved, the portraits of Sts Peter and Paul being some of the best we have seen. Small losses, not unusual, from when the cord was pulled from the bulla in antiquity can be seen affecting the R and the final I.
Provenance: Found Hampshire, England 1979. See Birch, W. de Gray, Catalogue of Seals in the Department of Manuscripts in the British Museum, Volume VI, No. 21,808 (only one example listed). 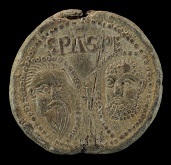 See also the Portable Antiquities Scheme database for a listing of Papal bulla found recently in England. 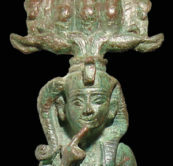 Unfortunately, the database does not yet have a full record of finds prior to 2000.